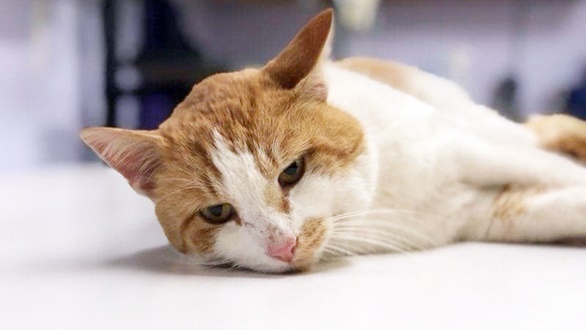 Oliver Queen, the cat who was found last Tuesday morning with an arrow embedded near his heart, still has a ways to go to make a complete recovery. This PoC article will bring you up to date. At this time the injured kitty is recuperating at the Humane Society of Richland County in Ohio. Oliver had an appointment at Phillips Animal Hospital in hopes of having two drains removed. The doctor said he had to keep the tubes in at least until Friday. The arrow missed Oliver’s heart by two inches. He had to be sedated to remove the arrow and place drain tubes in his neck and on his side. Oliver is in obvious discomfort but is allowing handling. Houghton said the arrow entered through his back and came out his neck. “It missed all the important stuff,” she added. While the injury likely was intentional, no information has been posted to prove this. If all goes well, Oliver Queen will be available for adoption in three or four weeks. He’s not feral and was eating at a house where a lot of stray cats are fed. Oliver is described as timid but can be picked up and held. Anyone who would like to donate to Oliver Queen’s medical expenses can click here or stop by the shelter at 3025 Park Ave. W. in Ontario, Ohio. Hopefully, the Humane Society will keep everyone updated on their Facebook page. This entry was posted in animal abuse, Cat News and tagged cat cruelty, cat shot, cat shot with arrow, The Articles of Elisa Black-Taylor by Elisa Black-Taylor. Bookmark the permalink. It seems uproars over intentional harm to cats is short-lived. Yes, the collective human memory is short.